The main objective behind participating in the event is to demonstrate our enterprise grade, well-engineered Security solutions. In the event, Matrix will showcase its futuristic technologies from the security domain. 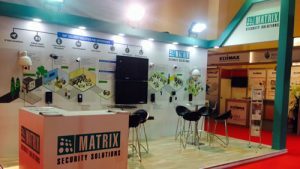 The Matrix Access Control and Time-Attendance domain will showcase its newly launched Aadhaar Enabled Biometric Device. This device is the first embedded Linux based Aadhaar enabled biometric device registered on AEBAS Server. This device offers unique advantages in terms of connectivity, technology, usage environment and ease of use. This device supports fingerprint as well as Mifare smart card as credential. This technology enables fingerprint plus Aadhaar number authentication with precise and accurate authentication. Talking about smart phones, Matrix will showcase its mobile based Access Control solution, whereby a user can either scan QR code or just twist his/her phone for Bluetooth authentication. Matrix’s Video Surveillance wing is going to sport a range of IP cameras incorporating SONY STARVIS series sensors with EXMOR technology. These cameras have an edge over other cameras in terms of exceptional low light performance, consistent image in varying light conditions (True WDR), better bandwidth optimization and many other features. These cameras, when coupled with Intelligent Video Analytics, provide excellent perimeter security and intrusion alerts through various means like SMS, Email, etc. We will also be exhibiting our Video Management System (VMS) SATATYA SAMAS, which can seamlessly automate the parallel working of various systems integrated in an organization. Alongside, we are going to present our Network Video Recorders that are equipped with characteristics like Cascading, Camera-wise Recording Retention, Database Level Integration and plenty other distinct features.